Padula was probably founded in IX-X century by some people, escaped Saracen devastations; its name derives from the numerous marshes which characterized this territory in the past. The town of Padula has the most important monastic monument of Southern Italy, the Certosa of San Lorenzo; the majesty of the building, a true "convent-city", and the exhuberance of the décor, make this an obligatory visit. 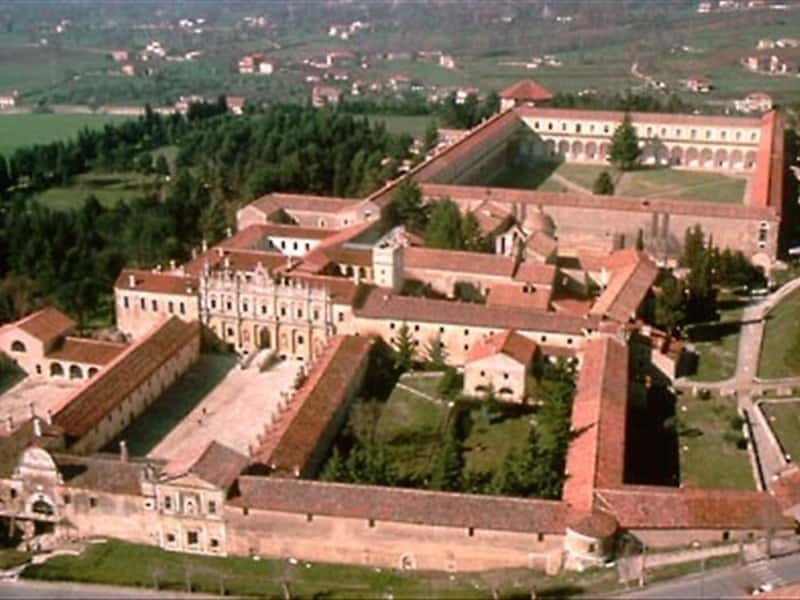 Founded in 1306, the monastery followed the order's rule which dictated that the monks' cells, gathered around the cloister, be separated from the common areas, which were located near to the church. The Church of San Lorenzo is separated by a wall into two parts. In the first, near the entrance, sat the lay brothers, and near the presbytery, the cloistered monks. There are also two choirs. The old kitchen is also interesting with its huge dominating "cooker-hood" in the centre, and connecting tunnels to the wine cellar and oil press. The Abbot's Apartment is the real gem of this convent, made up of ten rooms that open onto a splendid garden. The library has a lovely majolica pavement and the ample Cloister, onto which the monks' cells open, is also impressive. With a surface of almost 15.000 mt sq it is one of the largest in Europe: the two storeys on which the convent is built are connected by a grandiose double helix stairway. This town web page has been visited 49,110 times.